There's no contest. 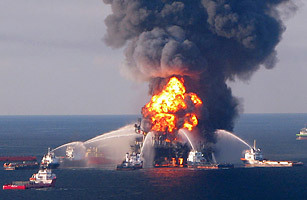 The biggest environment story of the year began on April 20  the 40th anniversary of Earth Day  when BP's Deepwater Horizon oil rig exploded in the Gulf of Mexico. That began what is now known to be the biggest oil spill in U.S. history, with at least 185 million gallons of crude pouring into the Gulf. The disaster grabbed the public's imagination as no environmental story had since, well, the Exxon Valdez oil spill in 1989. Underwater cameras revealed the daily failure of BP and the government to stop the flow of oil, while photographers captured oil-drenched beaches in Louisiana and animals slicked with crude. Environmentalists warned about an ecological catastrophe in the aftermath of the spill, while hoping that it would trigger a change in the way America consumed energy. One thing everyone agreed  the spill wouldn't be forgotten any time soon. And yet...that's exactly what seems to have happened. Once BP finally sealed the underwater leak and the video stopped, once the visible oil vanished from the beaches, so did public interest in the spill. The White House's moratorium on new deepwater drilling was lifted early, and industry is looking for new and more dangerous frontiers in the Arctic. There is still oil in the Gulf, but you wouldn't know it.